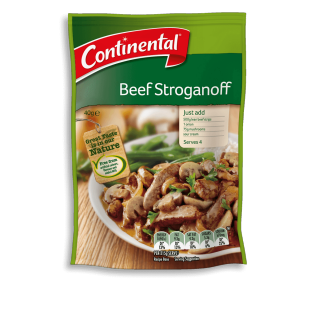 Enjoy Continental's classic beef stroganoff with onions and mushrooms topped with sour cream and sauce. Learn out how to create this dish at home. Sugar, corn starch, vegetable powders (tomato, onion), maltodextrin (from wheat), natural flavours, salt, potato starch, milk powders (cream, skilm milk), paprika, burnt sugar, yeast extract, natural colour (carotene), sunflower oil, garlic extract. Allergens:Contains wheat and milk products. Allergens:Made on equipment that also processes products containing soybean, peanut, egg, sesame, fish and crustacea.